Laurie Campbell: Our iconic yet declining and increasingly isolated Red Squirrel. As September begins we are seeing many changes to our native, non native and migratory species of wildlife. Many of our visitors are now leaving for sunnier climes and at the same time many that are staying are beginning to prepare for the coming winter. Squirrels certainly fall into this category and as the month progresses they can be seen beginning to horde food away for the coming harder winter months when food is less plentiful. Most of us are familiar with two main types of squirrel residing in the UK – the red and grey squirrels, however recent figures show a major increase in our less well known third species – the black squirrel. The black squirrel has actually been in the UK for some years, with the first record being reported in 1912. Until relatively recently however the population struggled to take a foothold but many experts are now predicting that they will be the dominant squirrel in many eastern counties with in 10 years, they are already estimated to make up 50% of the population in the Cambridge area. Black squirrels are a genetic mutation of our more familiar grey squirrel, but as well as their darker colour they are also faster, fitter stronger and more aggressive according to scientific research. Research also suggests that as well as being able to out-compete the grey squirrel they would also appear to be more sexually attractive to grey squirrel females – for the first time since their introduction in 1876 the grey squirrel would appear to have a major fight on their hands. Of course this isn’t good news for our remaining red squirrels either, for many years their numbers have declined as they have been out-competed by the American grey squirrels – clearly they will fare even worse against black squirrels. Laurie Campbell: Grey squirrels have enjoyed rapid population increased but are now becoming under threat themselves. Our current populations of squirrels are estimated to be in the regions of 2 million greys, 150,000 reds and 25,000 black squirrels – numbers which look set to change drastically over the next decade! Squirrels are regular visitors in many gardens and are very happy to gather various types of food from feeders put into gardens to supplement their natural diets. They are, however, not always a welcomed visitor and can be quite destructive to feeders and have a tendency to take a lot of food – some of which they horde away. There are numerous types of ‘squirrel proof’ feeder available that are either resistant to damage or attempt to prevent squirrels reaching the food. Alternatively many people set mini obstacle courses for the squirrels and delight at watching them workout how to overcome these devices for their reward. The preferred diet of squirrels is fairly similar regardless of species and whilst they are opportunists at the bird table their natural diet consists mainly of nuts and seeds although they will also eat certain flowers and even mushrooms and fungi. Due to this diet they are, perhaps slightly counter intuitively most likely to find food shortages (outside of gardens and bird tables) in early summer when growth has only just started and their natural foods are still forming. 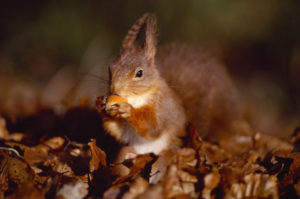 Whilst their diets are similar the are many differences between the foraging habits of the species with grey squirrel spending much more time on the ground than the red squirrels who often spend much of their time high in the tree tops of pines, hazels and beech. These differences often lead to grey squirrels having a wider and more varied diet than their red cousins whilst sharing much common ground. This increased adaptability of the grey squirrel has certainly lent itself well to giving them a competitive advantage, further to this is an advantage in body type. 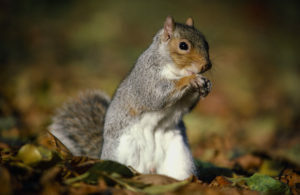 Grey squirrels generally carry much more body fat than red squirrels, and whilst the size difference between the species is not always great this can lead to a adult greys weighing almost twice as much as the reds, putting them in the stronger position of having more reserves when food is scarce. So, as we progress through September and towards winter (yes I know, bit early to be talking about winter – but did we ever really have a summer anyway?) keep an eye on your local squirrels whatever the species as they begin to horde and bury supplies to get them through winter. Just be careful with your assumptions though, recent studies have found that squirrels may be much smarter than we think. Many have now been observed just pretending to bury food to fool would be thieves such as other squirrels and birds such as magpies when they think that they are being watched – even by you!